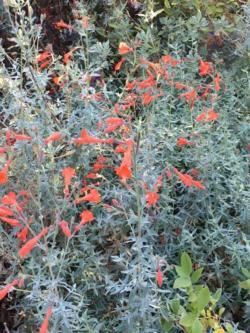 California fuchsia features scarlet-orange trumpet-like flowers that explode into bloom on upright stems in late summer and fall - just when many plants are often taking a rest. Foliage is gray-green and feathery, which creates a striking contrast against the vibrant blooms. It appreciates winter and spring rain, and then drier conditions come summer and fall. If grown in full sun and heat, it may perform better with supplemental irrigation, but it typically performs admirably in cooler settings or in part-shade with little water. Depending on the species, it grows to 3’ tall and wide or stays low to the ground as a groundcover. California fuchsia is one of California’s premier hummingbird plants, a surefire way to lure them to your garden. An incredibly easy perennial, it’s deer and drought resistant and only requires an annual shearing after it blooms. Epilobium looks great mixed with other natives in informal or rock gardens, and helps stabilize hillsides when planted en masse.